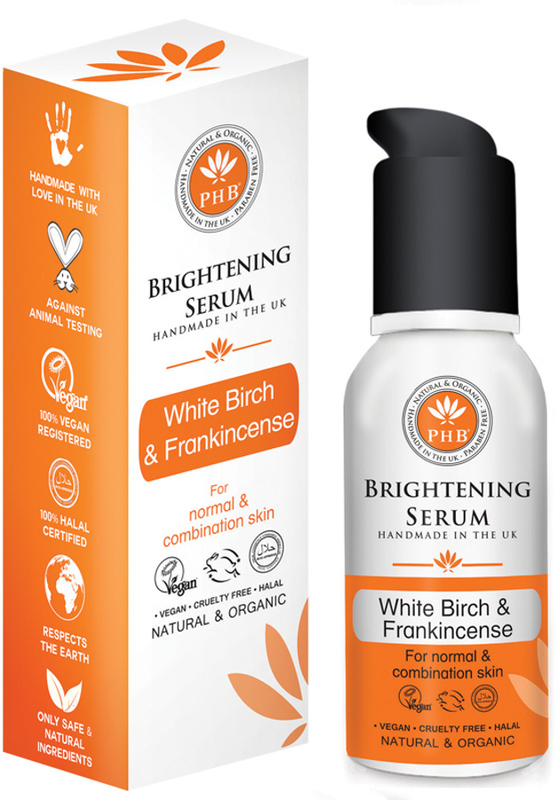 A skin brightening gel serum handmade with natural and organic ingredients from PHB Ethical Beauty. The vegan, cruelty free formula is enriched with white birch and frankincense to encourage collagen for a more youthful complexion whilst preventing & reducing dark spots and discolouration for a more even, radiant skin tone. Made in the UK and free from parabens, artificial fragrance & colours, petrochemicals, formaldehyde, phenoxyethanol, mineral oils and palm oil. PHB Ethical Beauty is a family owned company based in the UK and donates 20% of profits to charity. Aqua, Aloe barbadensis** (Organic aloe vera) leaf extract, Vegetable glycerin, Biosaccharide Gum-1, Coco-caprylate, Sclerotium Gum, Betula Pendula** (Organic White birch) bark extract, Propandiol & Salix alba, Helianthus Annuus** (Organic Sunflower) Seed Oil & Euphrasia Officinalis** (Organic Eyebright) Extract, Citrus paradisi (Grapefruit) peel Oil, Citrus bergamia (Bergamot) peel Oil, Boswella cartii (Frankincense) resin oil, Citrus aurantium (Neroli) flower oil, Benzyl alcohol, Commiphora myrrha (Myrrh) resin oil *Limonene * Linalool * *Citral *Geraniol *Farnesol *Occurs naturally in essential oils, **Organically grown ingredients. There are currently no questions to display about PHB Ethical Beauty Brightening Gel Serum for Normal/Combination Skin - 50ml.